Lobate/fan-shaped sand body that radiates downstream from an intersection point of a discontinuous channel (i.e. where the channel bed rises to the level of the floodplain). Tend to have a convex cross-profile, and fine in a downstream direction. Comprise sand materials immediately downstream of the intersection point, but may terminate in swamps or marshes as fine-grained sediment accumulates downstream. Formed when a discontinuous channel supplies sediment to an unincised valley fill surface. Sands are deposited and stored as bedload lobes which radiate from the intersection point of the discontinuous channel. At this point there is a significant loss of flow velocity. 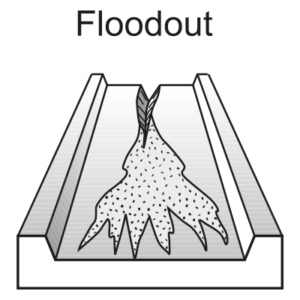 Beyond the floodout margin, fine-grained materials are deposited in seepage zones. Deposition associated with breakdown of channelised flow may reflect transmission loss and low channel gradient. Floodout lobes shift over the floodplain surface, preferentially infilling lower areas with each sediment pulse.